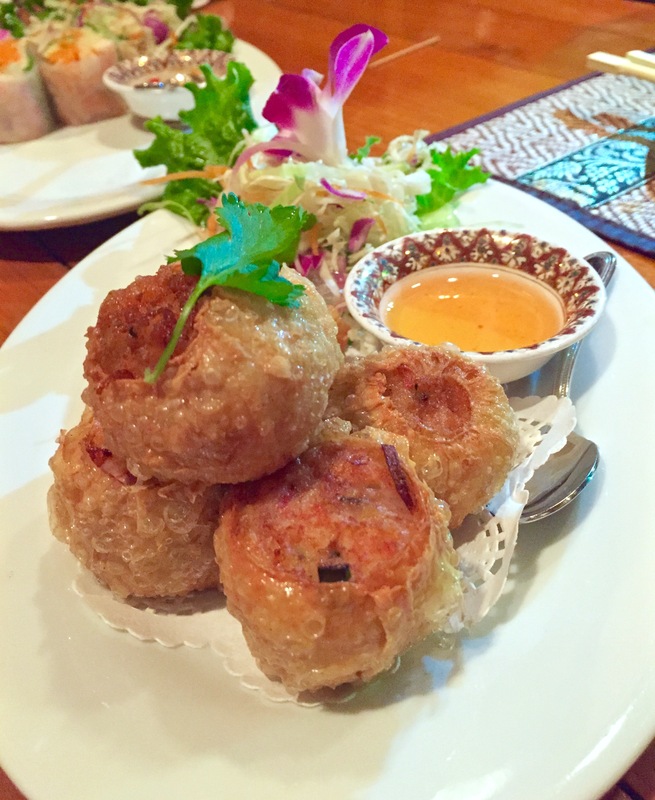 Eating good, authentic Thai food is like tasting an artist’s palette of colors. There are layers and layers of flavors: bright, sweet, sour, bracing, bitter, fishy, salty, rich, fiery, aromatic… the combination of which is so compelling that it blows away any assumptions about Asian food you might have had. You eat it and your culinary scope expands. I liked Thai food growing up on the east coast, where much of what we ate, often overly sweetened and marketed as “exotic” Asian food, was the same repertoire of menu items from one Thai restaurant to another: the same greasy pad thai, white-meat chicken laarb, and pick-your-protein green and red curries. This all changed on my first visit to Bangkok and several coastal towns and islands in Thailand, where my understanding of Thai food was knocked on its side, and then some. I was hooked. Since then, whenever I needed a break from the umami, salty, sweet, and spicy flavors that are most prevalent in Chinese and Japanese foods, which make up the main part of my diet, I always crave Thai. 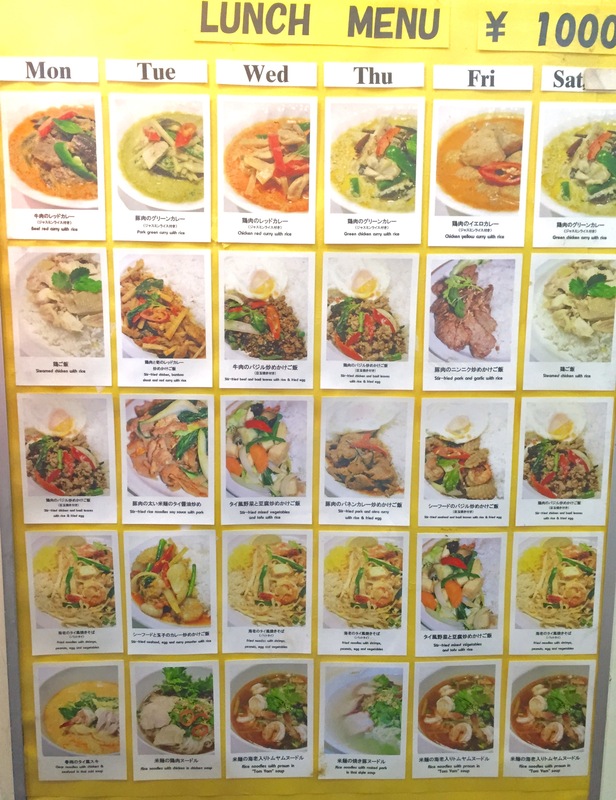 Even here in Tokyo, with the myriad of culinary selections to pick from, Mr. S and I have tried to seek out authentic Thai restaurants near us (around the Ebisu area). The two that we have tried, which both happen to be within blocks of each other in Roppongi, are highly-rated Thai restaurants in central Tokyo, and walk-able from our house. In my opinion though, one wins out in terms of flavor and authenticity, and the other one in terms of ambiance and presentation. 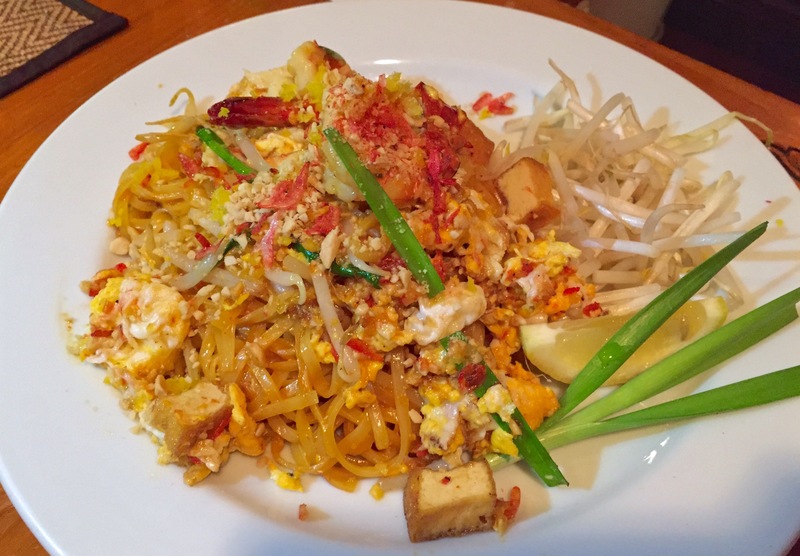 Mr. S and I tried appetizers, mains, and pad thai from both restaurants, and thoroughly enjoyed our experiences in different ways such that we would be happy to revisit each of them. Summary: A warm and elegant Thai dining experience with family-style size dishes that are on the sweet side, very reminiscent of American Thai food, with a few bold standouts. Food: We were hungry, over-ordered, and didn’t anticipate the large portion sizes, but were overall satisfied with everything. To start, we ordered two appetizers: fresh spring rolls and fried pork and shrimp dumplings with yuba (tofu skin) wrapper. 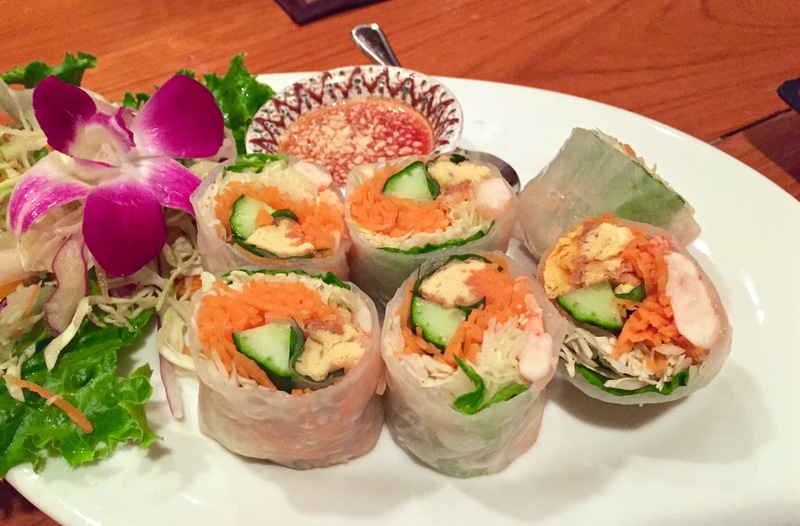 The spring rolls were refreshing and light, with chunks of shrimp, fried tofu, cucumber, carrots, carrots, mint, basil, and rice vermicelli in each bite. Nothing particularly outstanding, just very cooling and satisfying, especially on a hot summer day. Served with a very sweet and garlicky dipping sauce. 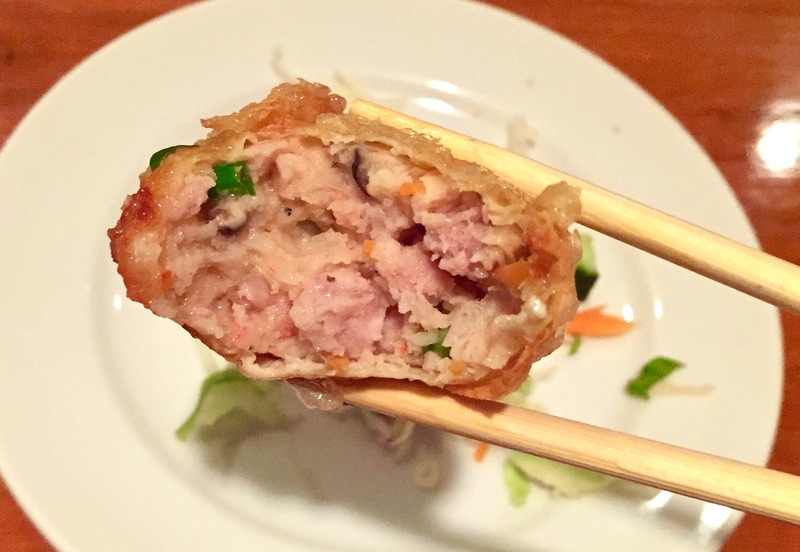 The fried pork and shrimp dumpling balls were exceptionally crispy due to the fried tofu skins as the wrapper. In contrast, the insides were juicy and umami, due to the shiitake mushrooms in the filling. Served with yet another sticky, sweet dipping sauce. For the mains, I highly recommend the Tom Yum Soup with Noodle. 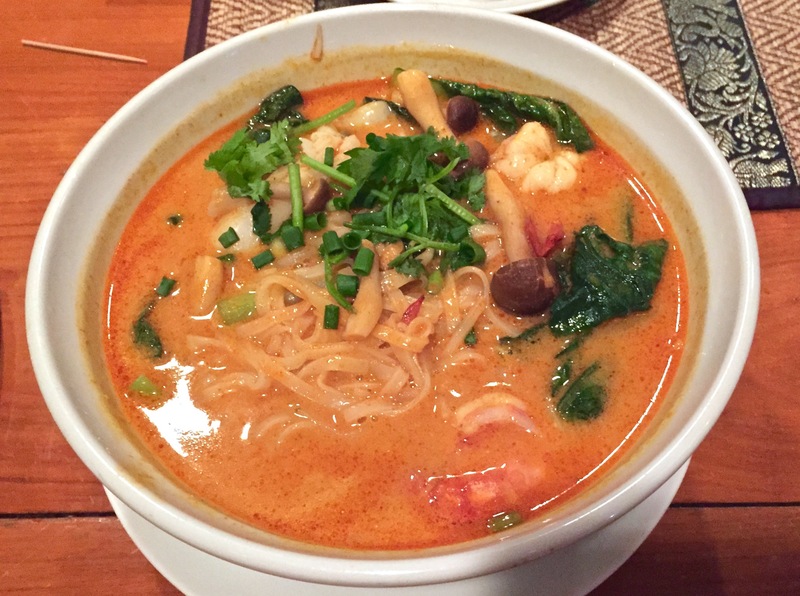 This well known spicy and sour coconut seafood soup traditionally is not served with noodles, but here at Jasmine, the noodle version turns the light soup into a hearty and satisfying main. Easily shareable between 3-4 people, this soup is full of plump shrimp, squid, scallops, and vegetables, swimming in a highly sour, umami, and rich soup. Bold and memorable. The cooked coconut milk coats the noodles nicely, like a Thai version of thick miso ramen. The pad thai was good, but definitely on the sweeter side. A spritz of the lemon garnish is a must, although a more traditional lime wedge would have done wonders. The noodles were also a bit more “wet” than I prefer, and a handful more preserved radish would added more depth to the dish. Again, the portion size is enough to share amongst 2-3 people. I can never pass up a dish featuring a whole entire crab, so I was tempted and ordered the Stir-fried Crab in Yellow Curry. 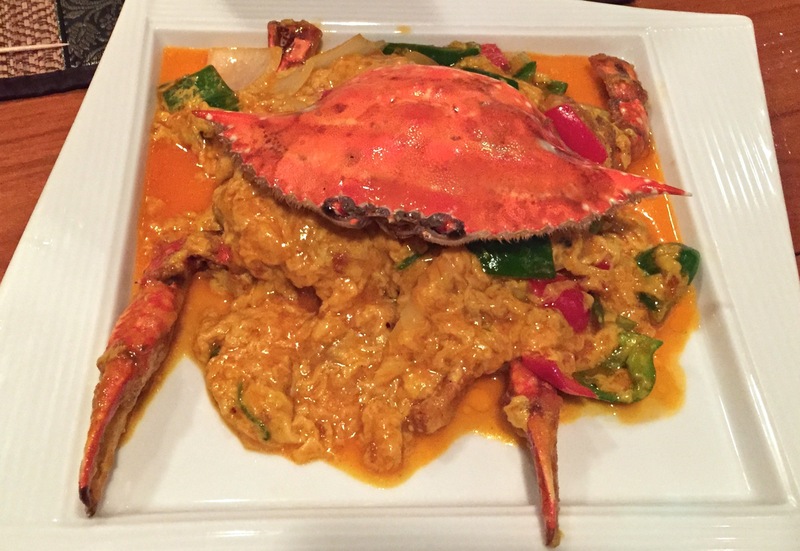 The crab is cut in half, lightly battered and deep-fried, and smothered in a curry, scrambled egg sauce with red bell peppers and onion. The presentation was impressive, and the taste was bold, but the strong curry flavors masked any sweetness of the crab. The dish overall was dripping in oil–curry oil–which made the dish feel and taste very heavy and unctuous. I recommend eating this with a big bowl of rice to soak up the curry oil and spices. Perhaps it was just our crab that night, but the crabmeat was mushy in texture and not at all meaty or chewy, which is a telltale sign of a previously frozen crab, not fresh. Unless a fresh crab is used next time (which is not asking for much in Tokyo) I would probably not order this dish again. Ambiance: Traditional lacquered teak wooden tables, chairs, and Thai décor (including a large trippy picture of the King) fill up this mid-sized restaurant, lending to a warm, tropical, yet elegant atmosphere. Even at 9:30 at night, most of the tables were filled, many with larger parties of 4 or more, dining family style, and sipping on tropical cocktails with lychee and mangosteen liquors. Many of the servers speak some English, and were able to help with answering our questions. Summary: A hole-in-the-wall restaurant serving no-fuss, authentic Thai home-style and streetfood based dishes that are more tart and umami than sweet. Chef is a Thai native, from Bangkok. Food: A scan of Bangkok’s menu revealed a decent sized Thai “salad” selection, which is always a good sign that the restaurant is using a good amount of fresh aromatics and herbs, as these ingredients dominate Thai salads. Unlike the leafy greens-based salads that we know, Thai salads are based heavily on a cooked meat, mixed with chopped herbs, such as lemongrass, kaffir lime leaf, mint, and Thai basil, with scallions and chilies in a fish sauce and lime juice based dressing. As a starter, we ordered the Grilled Pork Salad, which is a bit of a misnomer since what arrived did not appear to be grilled pork, but rather, large slices of lightly stir-fried, almost like steamed pork. There was no char on the meat. Certainly not disappointed, because the dressing and aromatics in the salad were outstanding. The layers of flavors of fish sauce, chilis, lime, palm sugar, lemongrass, kaffir lime, shallots, green onion, and toasted rice powder are enough to jolt you awake and play with all your senses. We ate this with spoons so we could shovel as much of the dressing into our mouths as possible. 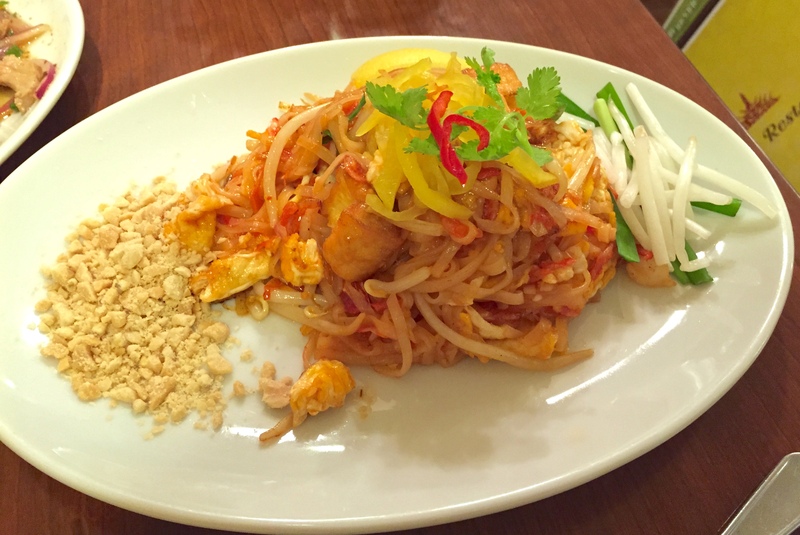 The pad thai, about one person’s portion, and wonderfully tangy and fishy. There was a brightness to this version that was sadly missing from Jasmine Thai’s. These noodles were also slightly more “dry” in comparison. I didn’t want to share this with Mr. S! 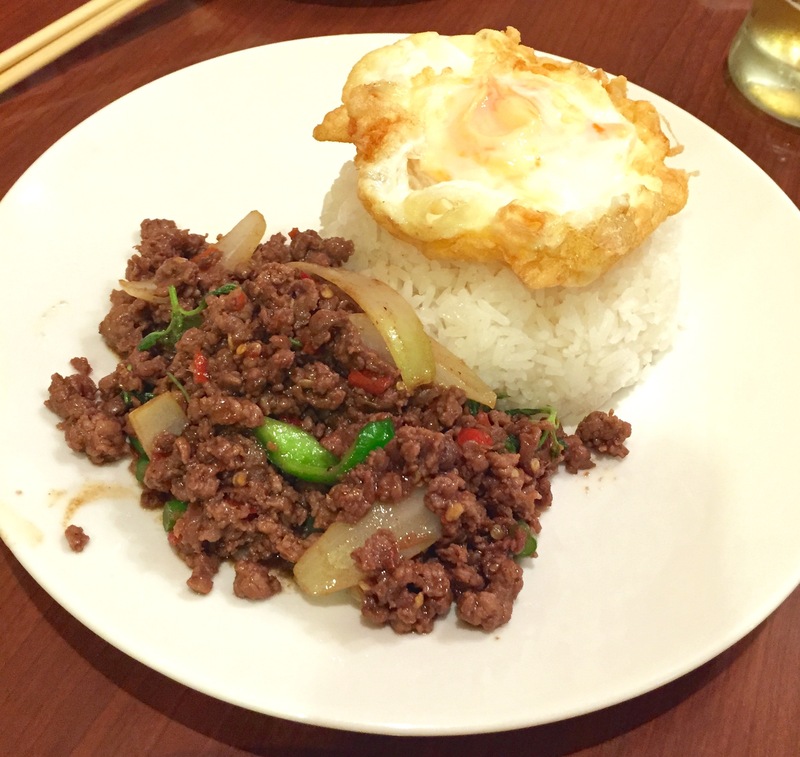 Mr. S ordered the Stir-fried beef with basil and rice plate. We often get this dish, the called ka pow, but the chicken version, from Thai restaurants in the U.S. and it’s always well seasoned and robust. This beef version did not disappoint. Instead of using ground beef, the chef at Bangkok chops up his own cuts of beef, so that when stir-fried, the meat retains good texture–chunky with good bite. The flavors were on point: sweet , umami, and spicy, with a generous hit of basil. Served with a heaping scoop of rice topped with a fried egg, this again was more of an individual portion rather than for sharing. Ambiance: Quite the opposite feel of Jasmine Thai, Bangkok, in comparison, is a much smaller space, with plain walls and décor. Not a place to bring a first date or to impress any out of town guests, it is however, a chill place to down a few Singhas with some homestyle fare. While we were dining, the restaurant quickly became full with groups and groups of salarymen. Taking a peek into their small kitchen, it’s a one-man show: a Thai chef in the back of the house. And a single server in the front of the house who doubles as host and server, and whose English is pretty good.